This series of blog posts will explore the different survey design techniques used to increase open rates, engagement and encourage the right people to give the kind of feedback that will make a difference to your business. Are These the Worst (Real) Customer Survey Questions You’ve Seen? I’ve seen a lot of customer surveys in my time and this is in the bottom 20%. If it came from a small company that didn’t know any better and didn’t have the ability to get good advice I’d understand. On the contrary this came from a tier one airline. Don’t make the same mistakes. 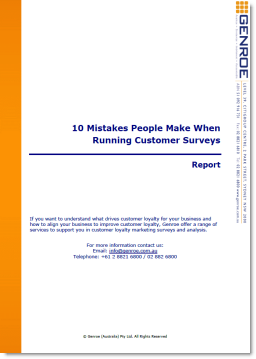 Here are the 7 important customer survey lessons you can learn from them. The invite for this survey was a well laid out email with my name, frequent flyer status and current points balance. Clearly they know who I am so why is the first question (and 14 others) asking basic information that they already know. If they know my frequent flyer status then they know all the flights I’ve taken with them for years – so why are they asking me for data they already have? The only reason I can image that they need to ask this question is just in case I didn’t fly under my email address or Frequent Flyer number.This may be true in a small number of cases but, in my opinion, doesn’t justify making everyone go through the extra questions. Asking questions when you already have access to the answers does not respect the respondent’s time. Fully 25% of the total questions in this survey are simple demographic or other information to which the airline already knows. Lesson 1: Respect your respondent’s time and ask only what you cannot determine internally. Their thinking is probably: just keep asking questions in the expectation that some people will respond to the whole survey even if most don’t. This, I think, is disrespectful to the respondents. They are not just numbers on a spread sheet. They are people who have invested their time in order to help you, for no intrinsic or extrinsic reward. The least you can do is be respectful of their time. Alternatively they could develop 3 or 4 or 5 sub-versions of this survey. They have a large enough sample size to split their respondents into smaller groups and just ask a portion of the survey to a random sampling of respondents. That way they would get all of the questions asked not just the first few percent. If you combined that approach with the item above you could easily generate four surveys of 15 questions that would cover all of the areas in the current survey. Response rates would go up and the data would be valid. Lesson 2: Be reasonable in the survey length. Several of the questions in the survey are not clear. Does the question below relate to who is liable for the cost or who made the actual payment? They are two very different ideas. For instance, I may pay for the ticket on my credit card but my company may reimburse me for the expense. Which do I chose? Lesson 3: Ensure your questions are unambiguous. Respondents are giving of their time and effort to provide information. You are being selfish and fooling yourself by requiring them to respond to all questions. How many women not wanting to respond to this question do you think either quit the survey at this point or enter “Male”, and visa versa. Quite a few. Lesson 4: Make no question compulsory unless there is a very, very good reason. Lesson 5: Always provide a Not Applicable or similar response. What specifically did you dislike about the boarding experience ?– the boarding process. 2. The clarity of the public address announcements. 3. People queuing before their seat row is called and clogging up the aisle for everyone else. Okay so that last one is a pet peeve of mine but you get the picture. Also this question only allows one response. What if I disliked the boarding process and the ground crew. Too bad I just have to give one response. Most of these issues are not rocket science. They are simply good manners and require thinking carefully about what you are doing. Have you seen a particularly bad survey recently. Let me know below. A very simple and easy to understand guide on How to Create a Google Survey.